Following The Other Art Fair I took some time off to trek in the Himalayas to Everest Base Camp. It was planned, I am not known to be “that” spontaneous outside of the studio, and we trained for the past 12 months to get in shape and trekking fit. It was a challenging but an amazing experience, a physical and mental endeavour of long arduous day with your body getting used to depleted oxygen levels as you climb in altitude. But the scenery, the cultural rub between Sherpas, villagers and trekkers and the personal rewards are multiple. I am certain it has changed me and wait to see how I walk my walk now a little different. 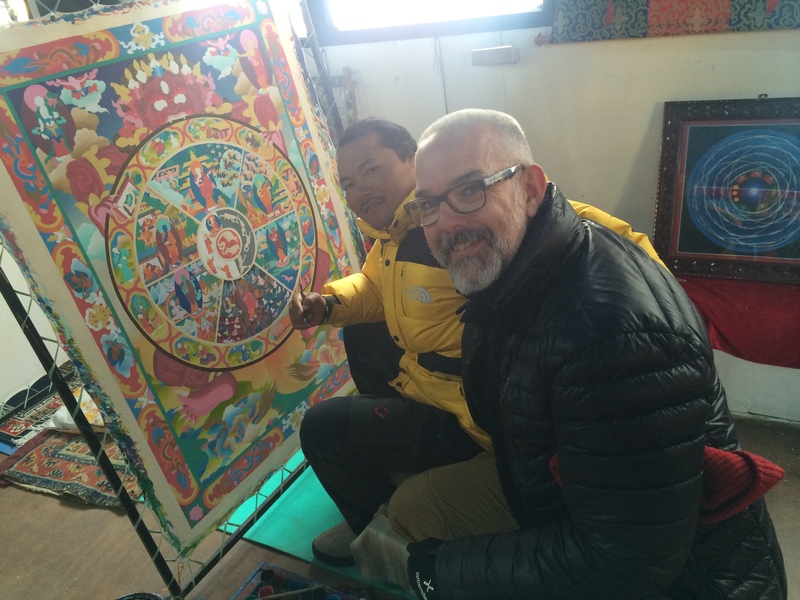 During the trek we stayed at a stunning village of Namche Bazaar where I met and spoke with local artist Babu Lal and we shared our experiences of being an artist, our processes and materials. 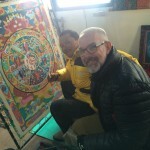 Finding many connections; rabbit-skin glue/yak skin glue and the use of a circle/mandala as a motif. Good times and looking forward to working with the gifts of glue and pigment he gave to me.